The door stop is the raised piece of trim in the center of the jamb. It is on the top and both sides of the door. 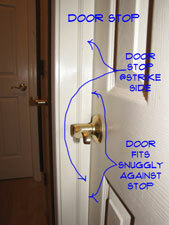 Sometimes and this is not common, the stop will need to be adjuste to get the door to close properly. Not sure if this is your problem? See the articles, 'How To Fix a Door Frame' and 'Troubleshooting Door Problems' for more information and a listing of all the door topics. As the name implies it acts as a stop for the door, not allowing it to swing through the opening and tear out the hinges. It also conceals the gap around the door, thus keeping the privacy feature of the door intact. The door stop can loosen up or it can be damaged. For door stop that is loosened and not aligned properly you can adjust it and nail it in place.To loosen the door stop, use a flat pry bar. Close the door and push the stop against the door gently. You want the stop to touch the door, but not push it back. Use a pencil to mark the proper locations of the stop. A #4 or #6 finish nail is usually sufficient for door stop. I am assuming that you do not have an air driven finish nail gun. Use a hammer and nail set to nail the stop back in place. Nail it every 12 inches or as needed. Touch up the paint or varnish and you're done. This was not such a difficult door frame repair. Replacing damaged door stop is similar but a bit more involved. Use a flat pry bar to gently loosen the stop. It is best to replace the entire piece, either the side or top. Take a piece with you to the lumber yard and find one that matches. They usually sell 7' sections which is enough for one side of the door. You will need to use a miter box either hand or power to cut the piece to fit. When you have the piece cut to the right size you can install it. Mark the location as described above and nail it in place with finish nails. You may have been fortunate and found a pre-finished piece that matches what you have. Likely case is that you will have to paint or stain it to match the existing. Done with this door frame repair? Good, move on to your next project. You should review the related articles, 'Adjusting Interior Doors' and 'Adjusting Exterior Doors' to make sure you have covered all the door adjustment topics.